It’s the middle of winter up here in the nothern hemisphere so that means two things for racers: heading down to the Australian heat or sticking around and battling in the mud of cyclocross. If you want to keep an eye on all the most important and interesting bike races in 2015 – bookmark our Race Calendar page (this is an old post and the linked content no longer exists). A six stage tour around Adelaide and other parts of southern Australia. The Tour Down Under (TDU) has been going since 1999 but it’s only since 2008 that it has held UCI’s top ranking and it is now the first event in the racing year to offer World Ranking racing. The route is generally pretty flat and undulating. A key ascent is the Willunga Hill which is only 3 kilometres long with an average gradient of 7.6% but the riders do have to do it twice. There is a King of the Mountains jersey on offer but the only jersey that folk are bothered about really is the Overall Classification – which is an ochre coloured jersey. Ochre is the national colour of Australia. The weather is arguably the main aspect of nature that riders will have to surmount. It can reach – and sometimes exceed – 40 degrees celcius! Last year’s winner was Simon Gerrans. Our good friend Andre Greipel has won the TDU twice (2008 and 2010) but will unfortunately not be present at this year’s event. It will be the last ‘proper’ event that veteran Aussie racer Cadel ‘Cuddles’ Evans will be doing before he retires for good in February. Who are the likely winners? It’s a really tough call to make. 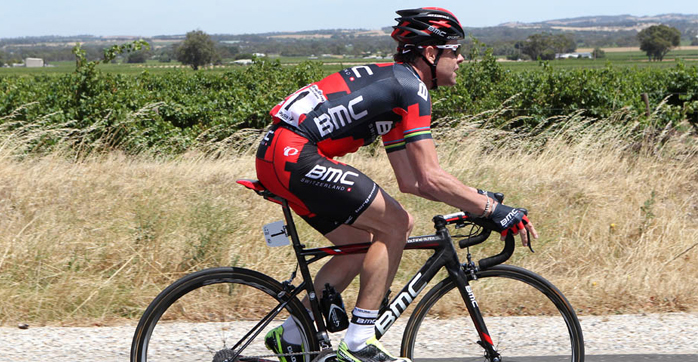 Australian racers frequently do well so Michael Rogers and Richie Porte will be extecting to come away with something. Of the visitors, German sprinter Marcel Kittel should do well. There will be eighteen teams in total who compete in the TDU. Each with a maximum of seven riders. A lot of teams have yet to declare their finalised team list. The infamous Astana team also have a big question mark hanging over them as to whether they’re going to appear at all. A quirky tradition of the TDU is for local fans (usually members of the Port Adelaide CC) to adopt an unknown domestique and treat them as an international cycling superstar. Mobbing them at hotels, painting the roads with their name etc. It’s always amusing to see who they choose and how the poor ‘victim’ reacts to it. The 2014 Cyclo-cross World Champion is Zdenek Stybar. Stybar also won the Champs last time they were held in his native country (Czech Republic). So you’d think he’d be the man to beat. And he is. But he may not even get to the start line due to injury. Boo! We’re a broad church of cycling tastes at Merlin Cycles. Road, MTB, cyclocross. We’re into it all. On the Merlin Cylces Race Calendar you will find details of all the most important or most interesting bike races that are happening both in the UK and around the world. It’s extensive but selective. Independent but inclusive. Tagged cx, cyclocross world champs, pro, racing, tdu, tour down under. Bookmark the permalink.